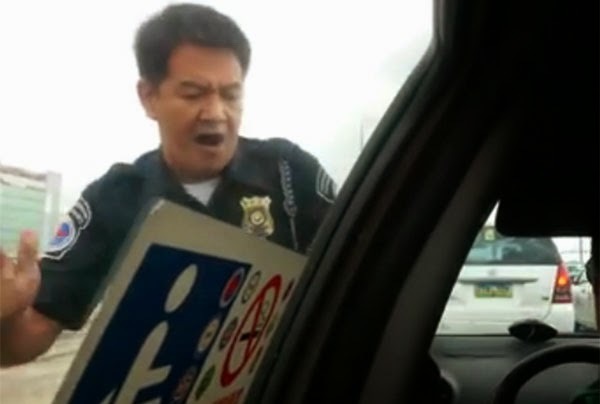 A video that shows an angry airport police officer smashing the window of an MGE taxi at NAIA Terminal 3 last Friday, December 12, has gone viral. The video, which was posted by a certain Grace Fabie, already got more than two thousand shares and over 15,000 views as of this posting. Fabie rode the taxi with her mom, Lucy, who arrived Friday afternoon at the Ninoy Aquino International Airport. Based on the video, the unidentified police officer got mad at the taxi driver after the latter allegedly blocked other vehicles as he was picking up passengers in the middle of the lane. Fuming mad, the police officer broke the taxi's front left glass window after the driver did not open the door and refused to give his license. Airport security guards were just looking at them during the altercation. The policeman told the taxi driver that he will pay for the damage.